Me:go Mark 2 FAST & POWERFUL Mobility Scooter. Manufactured by M&H Automotive USA, Inc. BRAND NEW--- NOT A SHOWROOM MODEL. Get wherever you need to go with me:go, one of the fastest Mobility Scooter on the market. Built stronger to go longer, me:gos engineering is regulated to reach speeds of 19.8 MPH (33 KPH) and distances up to 50 miles (80 Kilometers) with a single charge. Me:gos strong and durable frame design can carry a payload of more than 700 pounds. Me:go charges in just six hours from your standard household outlet, no charger needed. Me:go makes mobility simple with an easy to operate control panel and intuitive controls. Me:go lets you experience easy maneuvering with rear-wheel drive, automatic controls and speed reduction and electric safety breaking. Me:go is engineered and designed in Germany by experienced German engineers. Enjoy a more comfortable way to navigate your day with the me:go! Adjustable Ergonomic Seat with adjustable backrest, headrest, lumbar support and armrests. Handlebar with hand operated throttle and brake. Programmable Digital Display which is easy to operate and integrate with easy to read essential information. 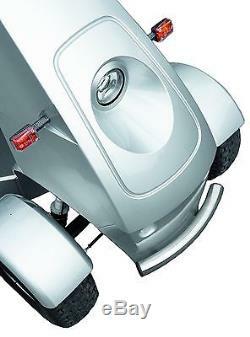 Stainless Steel Bumpers add security for the driver and classic elegance through the brushed stainless steel finish. LED Lights provide exceptional brightness and sustainability ensuring the vehicle is easily visible during all lighting conditions thus providing increased safety for the driver. Brushless 1.1 kW Electric Motor: completely designed and engineered in Germany by a team of experienced German Automotive engineers, me:go's maintenance free motor provides exceptional strength while being maximum energy efficient. Engine: Maintenance-Free Electro Motor, 1.1 kW. Drive Train: Automatic, Machanical Differential. Range: Up to 50 miles on one charge, depending upon factors such as payload. Weight, terrain, age of battery, etc. Charger: Integrated Charger; Deep Discharge Protection. Control: Programmable Control with Diagnostics. Lighting: According to DMV Regulations. Mark 2 with Handlebar, 00312, color Pearl White. Check out my other items. 2 Years for the frame. 6 Months for the batteries. 1 Year for functional capacity of components including mechanical and electrical components. The item is as described in the written description. WE ARE THERE FOR YOU! We would rather have a happy customer than an unhappy customer. If product is defective, it will be replaced or repaired at no additional cost to the customer. Be sure to add me to your favorites list. 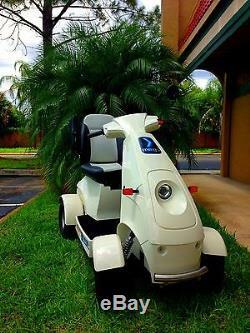 The item "Pearl White MeGo Fast Mobility Scooter, Heavy Duty, Powerful, Handle Bar" is in sale since Friday, January 23, 2015. 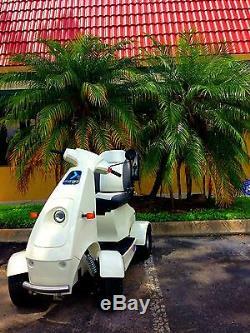 This item is in the category "Health & Beauty\Medical & Mobility\Mobility/Walking Equipment\Mobility Scooters". 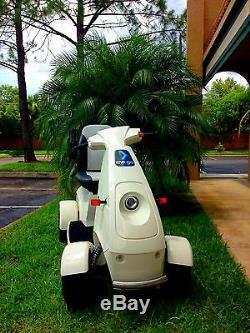 The seller is "goodlifemedical" and is located in Costa Mesa, California. This item can be shipped to United States. Weight Capacity: More than 650lbs.